Father Toufic, in my view, is an archetypal priest. As Parish Priest of St George’s Melkite church in Maaloula (Syria), he has pastored his parish through the worst possible crisis. Jabhat Al Nusra over-ran his town in 2013. Three years later, the signs of destruction are ever-present. St George’s church has been rebuilt but, as Father Toufic says, the other church buildings can wait until all the homes are rebuilt, and that project is far from complete. Syria has only just started rebuilding. Victory on the battlefield is still the priority and resources are scarce, and while the challenge of rebuilding homes is enormous, the even greater challenge is that of rebuilding relationships in areas where communities have been divided. Nowhere is that challenge more obvious than in Maaloula – a Christian town violated by Islamic extremists and betrayed by families from within its own Islamic community! 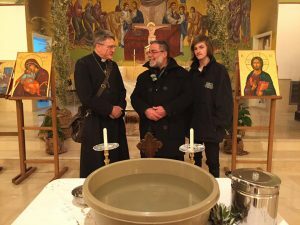 Father Toufic plays a vital role in helping to rebuild trust, and the essential ingredient, he says, is love – that most fundamental of all Christian virtues. Father Toufic points to a third path. It is a path that neither minimises theological differences nor denies historical conflicts but instead tries to overcome both with love!